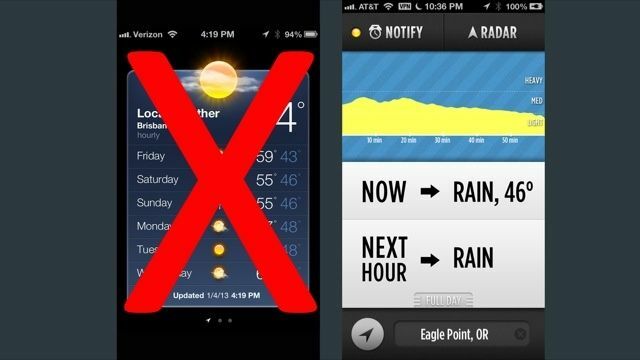 Dark Sky, our favorite micro-weather app for iOS, has just gotten a beautiful update to the big three-point-oh. Dark Sky’s just as simple as it ever was, but gives you a little more information about weather farther than an hour away, the ability to submit a personal weather support and meteorological data for our friends over in the U.K. Neat! * Intelligent text summaries – Descriptions of the current conditions, next hour, and the rest of the day now include more than just precipitation. * Personal Weather Reporter – Submit your own weather reports wherever you are to help make our forecasts even better. * UK Support – Dark Sky now works in England, Scotland, Wales, Ireland, and surrounding areas. * Accuracy improvements and bug fixes. You can buy Dark Sky for $3.99 at this link.